This sky/weather cam looks north into the sky over Mesquite Park and the Larkspur pool in Lantana, TX. If you look closely in the photo above, you can see that I've added some sealant to the camera. Hopefully this will help keep water out of it because the first camera was taken out by rain water getting inside even though it was suppose to be weatherproof. You can find this sky/weather cam (and others) on the Weather Underground app. Install and run the Weather Underground app and then go to the map. Make sure the "Webcams" layer is activated. You can find webcams and click on them for a time lapse. Here's a page with some selected still images from the Lantana sky and weather camera that I've collected. The camera is a Hikvision DS-2CD2032-I HD PoE mini-bullet camera that is monitored by Blue Iris software running on an 8-core AMD FX-8350 Windows 10 computer. About every minute or so Blue Iris uploads via FTP a still JPG 1920x1086 resolution image from the camera to Weather Underground. The image is compressed to try to keep the file size around 150 KB due to Weather Underground requirements. Forget everything you just read in the above (except for the computer being used). That was version 1. We are now on version 2 (as of 2018-10-18) with a new Hikvision 4MP DS-2CD2042WD-I PoE mini-bullet camera and I've changed the way images are handled. Blue Iris now saves a full-resolution (2688x1520) camera still to a folder and a batch script runs about every minute (via Windows Task Scheduler) to process the image by using ImageMagick to reduce the resolution to 1920x1086 with a JPG quality level of 75 to try to keep the image file size down to around 150 KB (if the image at quality 75 is significantly under 150 KB then it re-compresses the image with a higher quality level of 85). The batch script then uploads the image to a server (using pscp from PuTTY) and Weather Underground (via FTP using WinSCP). I believe this new method will allow for greater control and better reliability. UPDATE: In order to reduce the time from when an image is captured from the camera to when it is uploaded, a PowerShell script was developed to monitor the folder for new images and then to call the batch script to process the image as soon as a new image from Blue Iris is detected. Forget some of the stuff you just read above. We are now on version 2.5 and things just keep getting better. Instead of Blue Iris posting (saving) an image every minute, the batch script that runs every minute (via Windows Task Scheduler) now gets the camera image file from Blue Iris through its web server by making a simple local URL request using wget. This avoids problems and issues like monitoring the folder for when Blue Iris posts the image and then having to make sure the image file is complete (not locked) before trying to process it. It also minimizes the delay from when the image is captured to when it is available on the server. Forget some of the stuff you just read above. We are now on version 3 and things just keep getting better. Instead of using pscp, wget, and WinSCP, we're now just using the powerful curl utility and a new PHP script on the server. Using curl, the camera image file is now posted the the PHP script on the server which saves the image to the appropriate file. The page that refreshes to see the latest image from the camera refreshes about every minute. I have tried to adjust the camera settings to provide the best quality images for cloud monitoring/watching (i.e. good colors and avoiding blow-outs). I've also tried to adjust the settings to provide good images at night (i.e. so image is not too dark or too bright). 2018-10-18: A new camera was installed in the morning. Back in business, and hopefully for much longer this time! 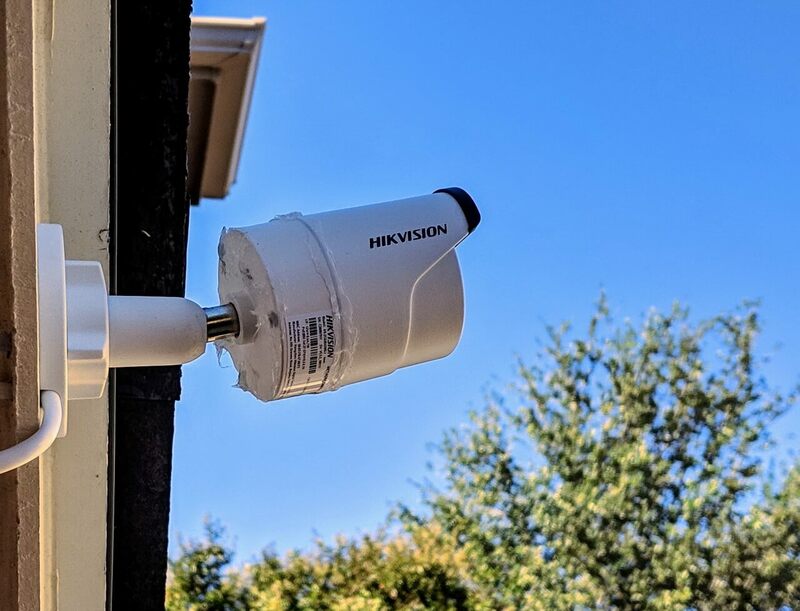 2018-10-17: Shortly after first installing a Hikvision DS-2CD2032-I camera in mid October 2018, it rained causing water to get inside the "weatherproof" camera and it stopped working. This ended up costing me hours of time (troubleshooting, research, and uninstalling and reinstalling the camera). I decided to buy a new camera, a DS-2CD2042WD-I, which should have better image quality. I plan on sealing some spots on it with a silicon sealant to help make sure water doesn't get into the new camera. The old camera was opened and the water removed, and it seems to be working again. I'm going to keep it as a backup (or for another use) and I'm going to seal some spots where I think water may have gotten in. Here's what the script that I run every minutes looks like (as of 2018-10-26). Requires curl (new window) and ImageMagick (new window). The script fetches a camera still with curl from Blue Iris (from camera skycam) through its web server. If the resized & compressed image file is less than %toosmallsize% bytes then it recompresses it with higher quality. After the image is uploaded to where it needs to go (Weather Underground and my server), the script then moves it into a folder representing the month (01 to 12). I plan on keeping one year of images. I use the stored images to create time lapses and to refer back to the images for whatever other reason I may want to do so. Obviously some things have been changed for security reasons.